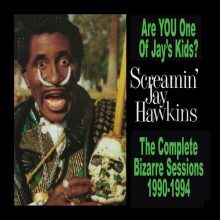 Screamin’ Jay Hawkins – Are YOU One of Jay’s Kids? Title: Are YOU One of Jay’s Kids? October is always a good month to remember Screamin’ Jay Hawkins (1929-2000), best known for over-the-top, voodoo-inspired performances of his underground hit, “I Put a Spell on You.” That song and more can be found on the two-disc compilation, Are YOU one of Jay’s Kids? – The Complete Bizarre Sessions, 1990-1994. Hawkins, whose career was lagging by 1990, was signed to the appropriately titled Bizarre label by co-owner Robert Duffey, after a serendipitous meeting in a Hollywood bar. Duffey assembled a backing band that included guitarist-keyboardist Mike Keneally (Frank Zappa), blues bassist Mark Goldberg, drummer Rik Shannon, saxophonist Dana Garrett, and later, guitarist-songwriter Buddy Blue. The music on this compilation is primarily drawn from the albums Black Music for White People (1991), Stone Crazy (1993), and Somethin’ Funny Goin’ On (1994). Some supplemental material is also included, including two Tom Waits’ songs, “Heart Attack and Vine” and “Ice Cream Man,” as well as improvised spoken word sections to create the feel of a live performance. Hawkins’ party versions of classics from the ‘50s and ‘60s, such as Howlin’ Wolf’s “Who’s Been Talking,” can be hit or miss, but are fun nevertheless. Need more tracks for your Halloween playlist? Besides a campy dance version of “I Put a Spell on You,” there’s also “Voodoo Priestess,” Tom Waits’ “Whistling Past the Graveyard,” and “Scream the Blues.” Broadway fans will also find a truly unique rendition of “Ol’ Man River.” All tracks have been digitally remastered, and liner notes by Chris Morris provide an informative look at Hawkins’ career during this period. Though there are a number of reissues and compilations devoted to Screamin’ Jay Hawkins, The Complete Bizarre Sessions offers a look at his later body of work, recorded before “rock’s great wild man” moved to France, never to return. This entry was posted in Rhythm & Blues, Soul, Funk and tagged Are YOU One of Jay's Kids?, Blues, Brenda Nelson-Strauss, CD review, Manifesto, Screamin' Jay Hawkins by aaamc. Bookmark the permalink.